The latest round of research funding has been awarded by Thornton Tomasetti’s R&D group, and staffers in several offices and practices are hard at work on bringing these new ideas to life. Projects underway include several sustainability analysis tools, a computer language training program for technical staff and a study on the implications of performance-based wind engineering. These projects were based on proposals submitted to Thornton Tomasetti’s Innovation Suggestion Box, which was launched last year. Funding for these research proposals allows Thornton Tomasetti employees to spend time outside of billable projects to develop unique ideas to improve operations across the firm. In a sense, the R&D initiative gives us a little breathing room to think big. Anyone in the firm can propose a research project, with submissions collected approximately once every quarter. In addition to getting resources allocated for their projects, employees whose proposals are selected also receive an iPad mini. Thornton Tomasetti’s Building Sustainability practice, in conjunction with our CORE studio, is developing a Rhino/Grasshopper-based, concept-level sustainability analysis platform. The tool uses Energy Plus’ robust energy simulation engine plus Radiance for daylight simulation within a parametric modeling environment by employing Roudsari’s Grasshopper Honeybee components. By linking these software packages together, we can generate accurate analysis faster as well as iteratively test various factors. The sustainability analysis platform PANDA allows users to experiment with multiple design iterations and obtain rapid feedback on whole-building energy use, utility costs and renewable energy potential. The C# Academy was proposed as a means of teaching designers and engineers at Thornton Tomasetti to read and write simple computer programs in a modern programming language (C#, which is pronounced “C Sharp”), which would extend and/or automate the capabilities of the software that we use daily. This will allow us to automate repetitive tasks as well as customize the software packages to better fit our needs. Under this research initiative, we will develop a curriculum and supporting materials to teach the basics of C# programming in a series of hands-on workshops for our staff in New York. If successful, the curriculum could be turned into a web course and/or be presented in workshop format in other offices. This initiative on structural embodied energy and embodied carbon (EE/EC) is motivated by our desire to move beyond the industry’s current relative illiteracy of the embodied environmental impacts of newly designed and constructed structures. In conjunction with the firm’s annual reporting to the AIA 2030 Commitment, led by Corporate Sustainability Officer Amy Hattan, we plan to develop more robust data collection mechanisms and associated QC protocols as well as achieve greater capabilities for data crunching and reporting. Ashrafi and Nelson are studying what it would mean to do performance-based wind engineering. Unlike seismic performance-based design, which is becoming a mature field, no one has defined what wind PBD is and what its potential benefits might be. Our team believes that by looking at the actual dynamic nature of wind loading, instead of the equivalent static wind loads that are typically provided to us by wind consultants, we will likely be able to achieve savings in design as well as higher reliability for high-rise structures. New York Associate Ali Ashrafi and Senior Project Director Joelle Nelson are studying the potential benefits of performance-based wind engineering. The purpose of this research is to improve the thermal performance of spandrel glass so that it can, at a minimum, meet the requirements of energy codes in terms of U-values for opaque walls. Uluaydin and Patrizi came up with the idea for this proposal together and built a team to collaborate with them on the research, which includes some well-known companies in the façade sector, such as Dow Corning, Permasteelisa Group and Technoform Group. In order to increase the marketability of the study and our findings, the team will try to go beyond code requirements in the United States as well as determine applications for LEED ratings that require a 20 percent improvement on energy usage over a conventional building. Additionally, this project will allow our Building Skin team to be better suited to perform complex thermal analysis as well create new and innovative exterior wall solutions. 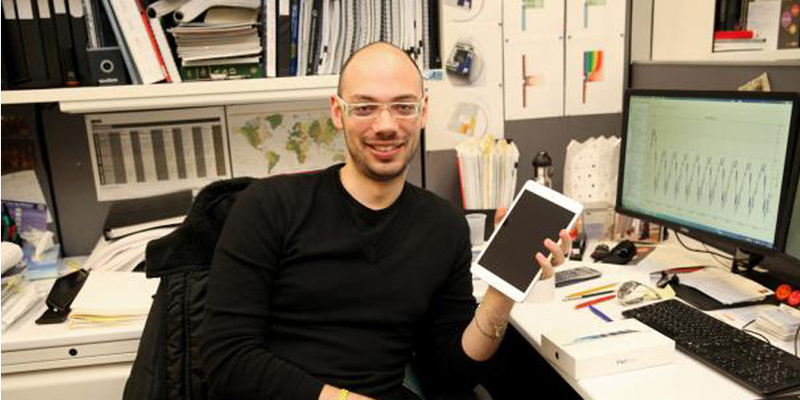 New York Senior Engineer Silverio Patrizi received an iPad mini for his proposal for a study to improve the thermal performance of spandrel glass. The ttEmbeds project will create a design tool that accompanies our typical embed plate connection detail. It will add a visualization component to bring ttEmbeds up to the level of proprietary anchor software like Hilti’s Profis. Tekla surfaced as a possible way to visualize the design work that takes place in Excel. The prospect of developing engineer-friendly links between Tekla and Excel was exciting, and the ttEmbeds design tool provides a significant and broad set of challenges in this regard. Beyond ttEmbeds, linking Excel and Tekla could improve other engineering spreadsheets, CSS design and modeling workflow, and possibly even be a stepping stone for getting more engineers to become comfortable with using Tekla. Chicago Senior Project Engineer Nate Sosin’s ttEmbeds project will allow the design work that takes place in Excel to be visualized in Tekla. Research into a new type of building damper in conjunction with a government agency has been progressing over the last few months. We have commandeered Managing Principal Gary Panariello’s office as research space and testing lab, which now includes a shake table and a number of pieces of analysis equipment. We have also had preliminary discussions with a developer and are planning to install a full-scale prototype into a new high rise that will start construction shortly. Stay tuned to learn about the latest pioneering projects being carried out by our staffers across the firm. We will update you on the next round of winning proposals, as well as the status of current ones, in the upcoming quarter.